According to the statistics section of the ISI’s website, there were almost 7,500 contacts made to to the ISI either by email or telephone up to the end of October. TWO MORE CASES were heard this month under the new personal insolvency regime with the first protective order granted last month. The two Protective Certificates were issued by Dublin Circuit Court on 14 November while the first was granted by Monaghan Circuit Court on 21 October. The certificates provide the applicant with protection from creditors for a defined period so that they work with a Personal Insolvency Practitioner (PIP) to agree a deal on the outstanding debt. 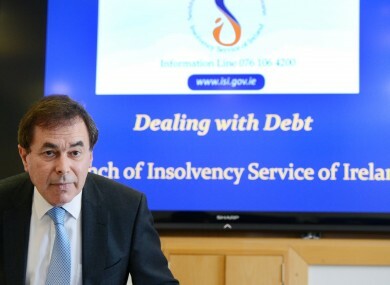 The new Insolvency Service of Ireland has been accepting submissions since September with the Minister for Justice Alan Shatter saying that it is not possible to speculate on the number of applications or arrangements expected for 2014 or 2015. He said that the ISI intends to commence issuing regular statistical reports in 2014 which will include the number of applications that have been made for debt relief arrangements. According to the statistics section of the ISI’s website, there were almost 7,500 contacts made to to the ISI either by email or telephone up to the end of October. The website itself had almost 100,000 visits up to the same date and currently has the contact details of 78 PIPs. The Minister also told the Dáil that at present the ISI has 88 staff members with approval to hire three more. Two staff members have an annual salary of over €100,000 with a further 32 over €50,000. The remaining 54 staff members have annual salaries of varying degrees between €20,000 and €50,000. Email “Two more insolvency cases heard under new regime as 7,500 contact ISI ”. Feedback on “Two more insolvency cases heard under new regime as 7,500 contact ISI ”.